Hamlets huddle and cluster in the rolling landscape between Bury St Edmunds and Haverhill, the occasional church tower punctuating the skyline above the copses and hedgerows. All Saints is a useful reminder that these are the towers of parish churches, not village churches. Coming here on the main road, you might think Wickhambrook to be a typically large west Suffolk village, just about close enough to Cambridge to provide it with commuters, but Wickhambrook parish contains a scattering of hamlets set around a grid of lanes, and a mile or so off from the high street you turn down a winding lane, and come out in a street of pretty cottages. 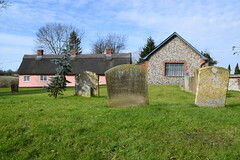 Here is the church, and the long pink line of a set of 17th century almshouses provides a beautiful western boundary to the walled graveyard. I've been here before a number of times, but it had been a good ten years since my last visit and coming back in 2018 I already knew, because I'd been told, that the church is now kept locked. There may be a good reason for this, as we will see, although it is still not much of an excuse. It is, however, very much against the trend in East Anglia, where many churches I found locked twenty years ago are now open daily.There was a keyholder notice with no less than seven keyholders, and a further two had been crossed out. One key was next door at the rectory, which was pleasing as it is more usual for ministers to delegate the task of being keyholder to someone who doesn't mind being disturbed by strangers. I walked down the path to the rectory, but I could see at once that the place was empty, and no one was living there any more. Luckily I'd taken a photo of the notice, and saw there was another keyholder in the cottage across the road. Unfortunately, the woman who opened the door was surprised and not terribly pleased to see me. "But I don't have a key!" she said, "I've never had a key! I was shocked to see my name on that notice! I've just recovered from a major operation!" I made my excuses and left, wondering why she hadn't crossed her name off like two other non-keyholders obviously had. At this point I decided that instead of haring off on any more wild goose chases or similar mixed metaphors, I would ring the next nearest, about a mile off. I explained that I'd rung just to make sure he existed, and he seemed happy with that. He was also very happy to come and open up, and said he'd be there in 5 minutes, but these were Suffolk minutes, and it was almost half an hour before he arrived. A part of me wished I hadn't bothered, because I already knew that All Saints is perhaps one of the less interesting of the churches in the area, but having rung him I obviously didn't feel I could just head off. 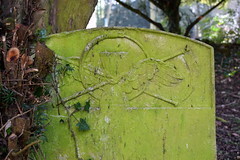 And in any case, patience was its own reward, for a wander around the churchyard turned up some extraordinarily good late 18th Century headstones, including one with the heads of five children flanked by two cherubs, and another featuring a winged hourglass and crossed scythes surrounded by a snake biting its own tail, a symbol of eternity. Even these pleasing discoveries gave time for a fairly lengthy examination of the building itself. 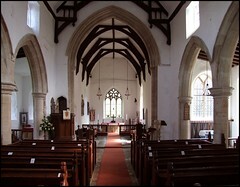 All Saints is a large, lovely church, of great age and dignity. 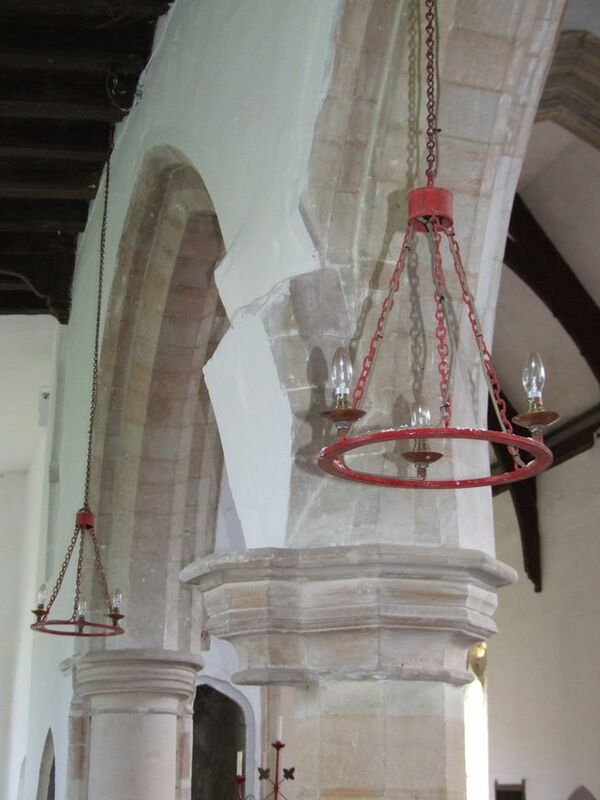 The first impression is of the great swathe of the 14th century aisles, with pretty clerestories peeping above them. But there is some evidence of Saxon work at the east end of the aisle, and so this must have been the site of the original church, the later chancel being built beside it, and the great nave and south aisle extending westwards. 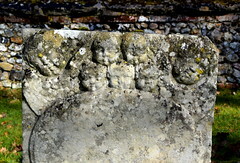 If you go round to the south side, you'll find a Norman carving reset high up at the west end of the aisle wall, rather unfortunately covered in perspex to protect it. It depicts a man holding a sword and a shield. When the pleasant keyholder arrived he told me that they keep the church locked now, because a visitor the previous year had unbolted the south door from the inside, and then come back at night and stolen an 18th Century table, presumably to sell in some New England antiques shop. I was about to suggest that the obvious solution was for the person whose job it was to lock up to check all the other doors too before they left, but it quickly became clear that the real reason they keep the church locked is that there is now no one left who is prepared to open and close the place each day. 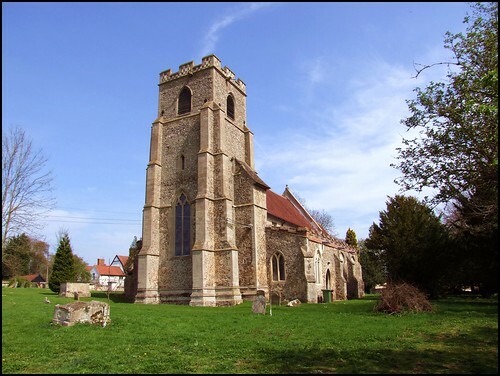 Are you the churchwarden? I asked him. I'm everything here now, was his startling reply. Arthur Mee remembers the forgotten 19th century romance Golden Days by Edna Lyall, which is set in Wickhambrook. The hero visits this church, which he finds "plain enough and bare enough to please a puritan". 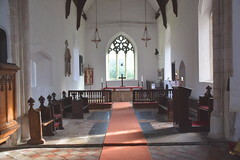 There is certainly a sense of space, and the size may account for its bareness, although Lyall might have known the church before its considerable 1860s reordering. In those days, the pulpit stood at the west end, and the seats faced west rather than east. This was not unusual in puritan hotbeds, and it attempted to break the link between the eastwards view and Catholic sacramentalism. 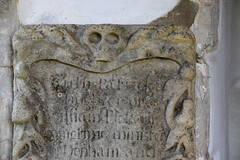 The same was found elsewhere in Suffolk at Bramford and Little Bealings. Certainly, puritan staunchness seems to have dispensed with Catholic romanticism in this parish. Peter Northeast records that a new Vicar, arriving here fresh from the ferment of Tractarian Oxford in the mid-19th century, could not find a single person in the parish who knew the dedication of the church. 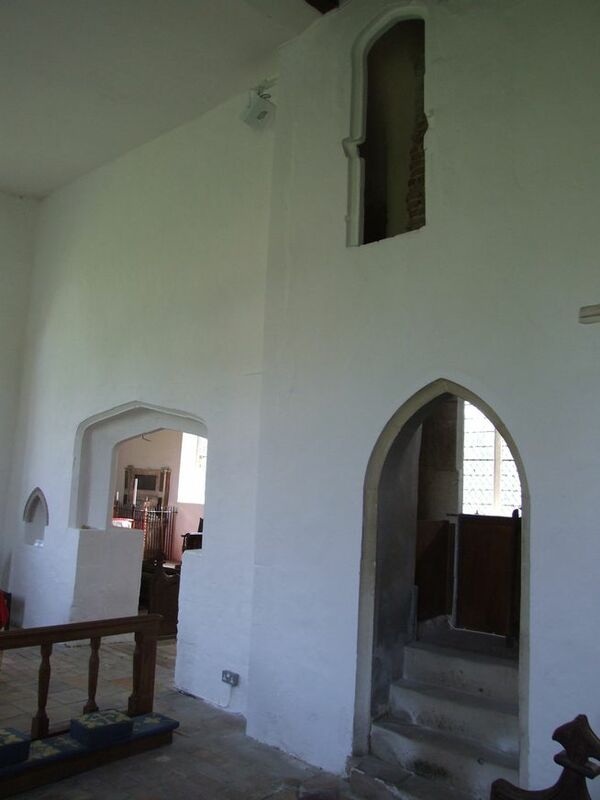 The view eastwards is a remarkable one, with the beautiful low east window, and a low arch connecting north aisle chapel and chancel. The rood loft apparatus describes a winding path, and up in south side of the sanctuary there is a fine railed memorial to Thomas Higham. He lies defiantly, sword in hand, as if ready to take you on in mortal combat, something he is, in fact, remembered for doing on more than one occasion. There are a couple of puzzles. About two thirds of the way up the north aisle, on the north side of the arcade, is the springing for an arch. It seems complete incongruous, unless it is in fact the north aisle which is the site of the original church, and a chancel arch was intended here before they decided to build the church bigger. 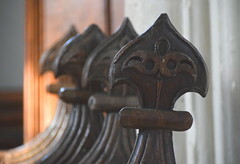 And the font bowl is a most unusual shape - I think it must once have been square, and was cut to its octagonal pattern, perhaps in the late 14th Century, to suit changing fashions. 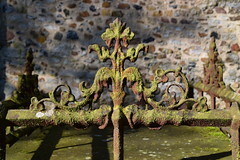 The font was one of my main reasons for wanting to go inside again, for on 7th July 1833 it was the place of baptism of Elijah Carter, probably the most appalling of all my known ancestors. He was one of my sixteen great-great-great-grandfathers, and after moving to Ely in the 1860s he was regularly charged, fined and imprisoned for domestic violence. It wasn't just his family who suffered at his hands, for the Ely newspapers describe his acts of drunken destruction with monotonous regularity in the 1870s. 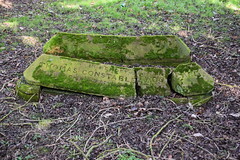 His periods of residence in Cambridge prison increased in length, and by the 1880s he had left the family home altogether. The last trace I have of him is of a period of imprisonment for vagrancy in 1890, after he was found begging with menace on the streets of the city. He doesn't seem to be on the 1891 census, and so he probably died soon afterwards, perhaps even in prison. No doubt the family were glad to see him go. Elijah's daughter Sarah married Thomas Cross in Ely Cathedral in 1881, and their eldest daughter would grow up to be my dad's Grandma Sophie. She married Arthur Page, who was killed at Delville Wood in the Battle of the Somme on 20th July 1916, twenty years before my father was born.